MOSCOW, March 22. /TASS/. There is no meeting planned between Russian President Vladimir Putin, Ukrainian presidential candidate Yuri Boiko and head of the political council of the Ukrainian party Oppositional Platform - For Life Viktor Medvedchuk, Kremlin Spokesman Dmitry Peskov told TASS. "There are no such plans [to hold a meeting between Putin, Medvedchuk and Boiko,]" he said, answering the question on whether the Russian president plans to meet with these two Ukrainian politicians who are visiting Russia. Earlier on Friday, Russian Prime Minister Dmitry Medvedev meet with Boiko and Medvedchuk. The politicians discussed, in particular, issues of cooperation between Russia and Ukraine in the gas sphere. Gazprom head Alexey Miller also took part in the meeting. 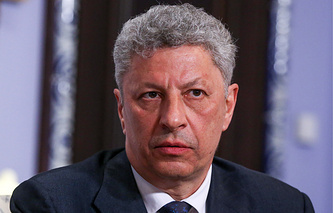 After the consultations Boiko stated that he is satisfied with the results of the meeting and called it "the start of negotiations" which "will lead toward the abolishment of mutual restrictions" between Russia and Ukraine. Medvedchuk also called the conversation a very important one, supporting Boiko’s decision to restore the Russian-Ukrainian trade-economic ties. The Ukrainian presidential election will be held on March 31.